After you have figured out how to sell a home with pets, your next mission will be to figure out how to move with them. As exciting as it is to move to a new home, there is always a fair amount of stress involved in the process. This is true for everyone in your family – including your pet. Whether you have a dog, cat, Guinea pig or fish, you can guarantee that your pet will suffer from at least some stress while moving. 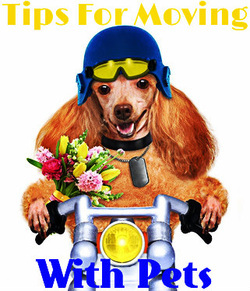 Below you fill find 13 exceptional tips for moving with pets that should hopefully make your life less complicated. To minimize the amount of discomfort for both you and your pet, take some time to prepare and plan your move. Focusing on the before, during and after of the move will make everything easier and safer for your animal companion. Use these tips for moving with pets to make your life far less complicated and stressful! Pack over time. This moving tip is guaranteed to make things easier on both of you. Many people make the mistake of waiting until the last minute to pack up all of their belongings. Packing always takes more time than you expect. You wind up going through a bunch of old things that you didn’t even know you had and it takes a while to separate out what you want to keep and what you want to give or throw away. If you are hurried your pet will often pick up on your anxiety, making it more uncomfortable and anxious. Pets also tend to like things they way they are and tearing up your home over a short period can really upset an animal. Research pet laws and regulations. One of the often overlooked tips for moving with pets is to find out what the laws and regulations are about owning a pet in your new area. You may need to register the animal, pay a certain fee or meet different vaccination requirements. Knowing all of this beforehand will give you time to take care of it before you arrive. Talk to your vet. Let your vet know that you are moving so he or she can help you prepare your animal. You may need to update vaccinations. If you are moving far enough you might want to get a recommendation from your current vet on a new vet in your area. If your pet suffers from any sort of anxiety the doctor can prescribe you medication to help. He or she can also fill prescriptions for any other necessary medications. 28 Update all pet identification. Your pet should have a good collar that is unlikely to slip off. Update your pet’s id tag with your new information including how they can contact you in case of emergency. If your pet is micro-chipped, be sure to contact the company that stores the microchip information to provide an update. If your pet is not micro-chipped, now is a good time to have it done. Dogs and cats can become lost very easily in a new neighborhood and you want to make certain they can be identified. Micro-chipping for pets is relatively inexpensive. Now almost all veterinarians and animal control organizations scan incoming pets for microchips, so the fact that you are the owner will be known. Also, take a current photo of your pet – just in case. Prepare your new home. It is easiest to do this while the house is still empty. Scan the fence for any holes or gaps the animal could get through and repair them. Make sure there is no leftover poison out where a dog could get to it. Doing a general safety and security check will make you more comfortable letting your animal loose. Depending on the personality of your pets, you may find that they are either frightened and confused or completely hyperactive. Your pet might be just as excited to be in a new environment as you are or just as easily be upset by it. Once you have brought your pets into their new home making sure that they have everything they are used to like their bed, food, water and toys becomes important. You want to make the move with your pet as stress free as possible. Make a travel kit. Set aside a small supply of food for your pet, along with its bed, toys and any other things that you will want quick access to. This way you can pack most of it along with the rest of your belongings without worrying about digging through boxes to feed your animal. Secure the pet in your vehicle. It is worthwhile to secure the animal for the trip on moving day. It may be quite agitated and prone to running off or acting up – the last thing you want while you are driving or when you get out of the car. A kennel or carrier is the best option when secured in the back seat. A car restraint is also an option. Stay secure on moving day. – Keep your pet secure on moving day. It may be easiest to leave it with a friend, but if this is not an option you should determine how you will keep it isolated and safe as you move out of the old house and into the new house. You can keep it in a crate or a bathroom, for instance. Just keep checking on the animal periodically and make sure it is comfortable and fed and watered. Start small. – With dogs and cats it is often best to start small in the new home. You know your animal best, but keep in mind that generally an animal will be more comfortable staying in a smaller area like a bedroom before having full rein of the house – especially cats. Meet the neighbors. While it may sound corny, one of the best tips for moving with pets is to introduce them to your new neighbors. As stated before, it is easy for dogs and cats to get lost upon first moving to a new area. If they get out you want as many people as possible to know they are yours. Consider taking your pet around with you as you go to introduce yourself to your neighbors. This way if your pet does escape your neighbors can tell you about it. Walk your dog. Throw a leash on your dog and start walking as soon as you can. Dogs love to explore and smell new smells, so it will help reduce the stress of the move. It will also give your dog some reference points on how to find his or her way home. The more often you can walk the better your dog will know where home is. Research your new area for your pets. Once you have gotten comfortable at your new place you shouldn’t wait long to also transition into finding out the things that are important for your pets. For example one of the first things you will want to do is contact your new veterinarian. It is possible the veterinarian who you have been using may be able to help you with this if you are not moving out of state. Your new vet is going to want all the records and medical history so don’t forget to get copies of these documents from your old vet. They are also going to ask to see a copy of your pets current level of vaccinations as well. Once you have a new veterinarian for your pets, ask them if there have been any high incidences of Lyme disease or heart worm that you should be concerned about. Additionally you should also ask if there are any local vaccinations that the town or city requires. In the off chance your pet becomes injured you will also want to research where the closest animal hospital is located. It is always better to be safe than sorry. The last thing you want to be doing if your pet becomes hurt is to be scrambling to find out where you can take them! Use the internet and your neighbors to find out about nearby pet stores, parks and especially dog parks if you have a dog. Knowing about all these places before you need them is a good idea. Find out local laws and customs. Finding out whether there are any specific leash laws will also be an important consideration.Some cities and towns require dogs to be on leashes at all times or possibly during certain hours. If you are buying into a planned community or a condominium complex where there is a homeowner association you should also make sure you take a very hard look at their by-laws to see what you can and can not do with your pets. When you purchase into a homeowners association you will be governed by other peoples rules. Many people lose sight of this if they are used to having a home where no such arrangement exists.